Affordable Accoutrements: The Real Tables of Affordable Accoutrements! The Real Tables of Affordable Accoutrements! Often readers will ask if the tables they see on Affordable Accoutrements are used for "real world" entertaining. Sometimes the answer is yes. On those occasions, the table settings are often scaled back considerably by the time guests arrive. The table below was set quickly, using dishes, glassware, and flatware that are all automatic dishwasher-friendly. I was serving a simple lunch for friends before heading out to a matinee showing of "The Help" (loved the film by the way!). I hadn't intended this to become a tablescape post, but thought, "Why not?" The dishes are Charter Club's "Country Chateau." They were made for Federated Department Stores in the 1990s. These were a Goodwill find. The stemware is Rock Sharpe, and the stem shape is 3005. The company produced these in the 1930s and 40s in a variety of cut and etched patterns. You can read more about them HERE. I collect them according to shape (and ignore the pattern). I think mixing the patterns, while keeping the shapes consistent, adds interest to the table setting. The floral napkins are an easy-care blend, and the napkin rings are stainless. The flatware is "American Harmony" stainless made by Oneida. The washable cotton placemats came from a local estate sale. 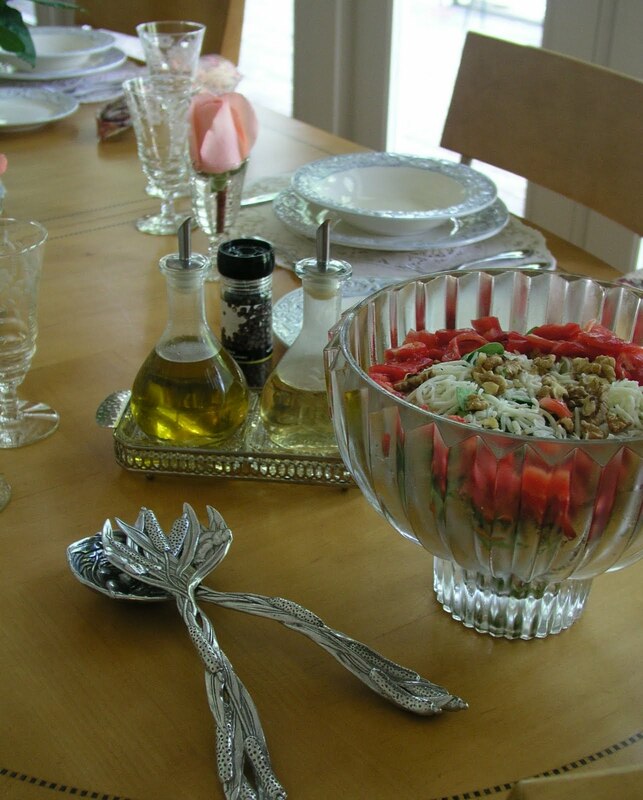 The lead crystal salad bowl is from Belk. The oil and vinegar cruets were purchased at Ross, and the stainless caddy with glass inserts is from Goodwill. The salad serving set was a consignment shop find. The light vinegrette dressing is store bought. Serving it in a vintage Duncan & Miller "Canterbury" (1939-55) creamer provides a considerably nicer presentation than passing the bottle around the table! 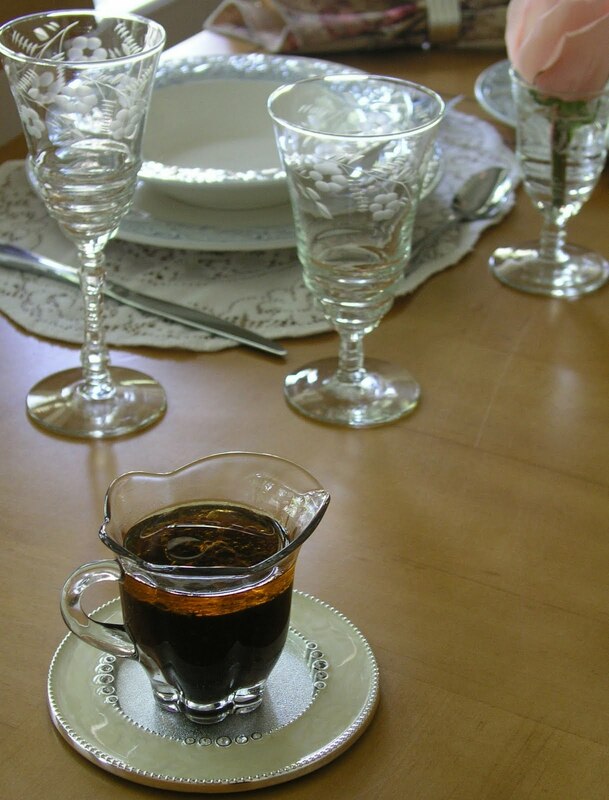 The creamer's glitzy coaster (from Goodwill) is intended for use with a pillar candle. The roses are from Kroger. They're currently only $7.77 per dozen, and I love the color! Unlike many supermarket roses, these have a sweet, subtle fragrance. I arranged them very simply in lead crystal vases from Goodwill. 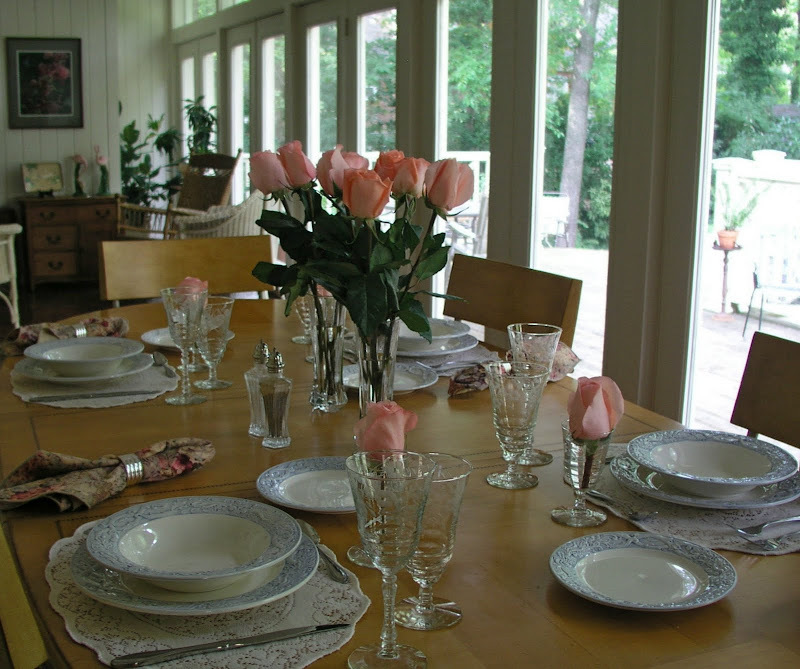 Having two vases rather than one allows the individual bouquets to be moved to the ends of the table when the meal begins. Each place setting has a single rose in a Rock Sharpe juice glass. I re-cut the stems under water and moved them quickly to the containers (to which flower fresh had been added). As so often happens, the flowers continued to open and were far more lush and beautiful later in the day after guests had gone. So ... no late afternoon sun streaming across a table set for eight. No photos by candlelight (and no candles since it was a luncheon). I thought of taking a picture of the post-meal kitchen "carnage" after we had dashed off to see "The Help," leaving clean-up for later. But it wasn't a pretty sight, and I prefer showing you (what I think are) pretty things. If you're wondering, the salad began with bagged romaine and veggie mix. I added baby spinach, low-fat shredded mozzarella, locally-grown tomatoes, and English walnuts. The main course was shrimp, red onions, and thinly sliced lemons sauteed in butter and olive oil, served over rice (seasoned with black pepper and a dash of hot sauce) -- no recipe; I made it up as I went along. The round loaf of artisan bread came from the Kroger bakery. I heated it in the oven, until the crust was nicely browned, and served it with olive oil and freshly ground pepper for dipping. Dessert was super-easy: caramel praline ice cream served in Rock Sharpe sherbets, drizzled with coffee liqueur and topped with chopped pecans. Cookies from the Kroger bakery tasted almost homemade after heating for a few moments in the toaster oven. To achieve the look of single roses in small glasses, stem length is important. Too long, and they tilt to one side or the other. If cut too short, they don't have the support they need. Normally I cut flower stems at an angle. Cutting these straight across helped prevent them from leaning. Naturally, a larger flower works best. My inspiration for the roses came from the cover of William Yeoward's "On Entertaining." I wasn't familiar with the work of the immensely talented Mr. Yeoward until he was mentioned in a very kind comment I received from Jane and Lance Hattatt. Jane and Lance blog about their "two lives embracing the eclectic, the eccentric, and the esoteric." I urge you to visit HATTATT at your earliest opportunity. Every post is witty, stylish, informative and fun! Click the cover photo below to see the Amazon listing for the book -- truly an amazing, inspiring volume available at unbelievably low prices! Please join Susan of Between Naps on the Porch every single week for Tablescape Thursdays. Bill another beautiful table and so perfect for a simple lunch with friends. I really love those plates, the edge pattern is lovely. How very, very kind and generous of you to make mention of our blog. It was so unexpected and we were thrilled to see the link at the end of your most entertaining and beautifully presented post. Thank you so much. Your lunch sounds wonderful. Oh how we wish we could have been amongst your guests. What struck us about your table setting was that, although essentially simple and bringing together a variety of eclectic elements,it was orchestrated with a restrained elegance that made it eminently suitable for a relaxed lunch but yet stylish enough to show your guests that you had taken time and trouble to make them feel special. We are delighted to see that you have tracked down William Yeoward's book. His store in London on the King's Road is a delight and we are sure that you would love it since we can see much of your style reflected in his.Not so long ago William Yeoward's guest cottage was featured in House and Garden and is a perfect example, we feel, of how to combine comfort, practicality, beauty and good design. A winning combination which we can see in your lunch and table setting which you show us here today. Amazing table and roses, I love it! Beautiful!!! Love the color of the roses, and your attention to detail, even in a low key setting is inspiring! So pretty !! Lunch sounds yummy. I have heard the movie is good - looking forward to seeing it and reading the book. Read the book, but haven't seen the movie yet. Love William Yeoward's line. Beautiful. The roses are gorgeous. Amazing what you can find at Kroger's when you take the time to look! Very nice! A beaitufully soft look and one obtained without too much fuss. 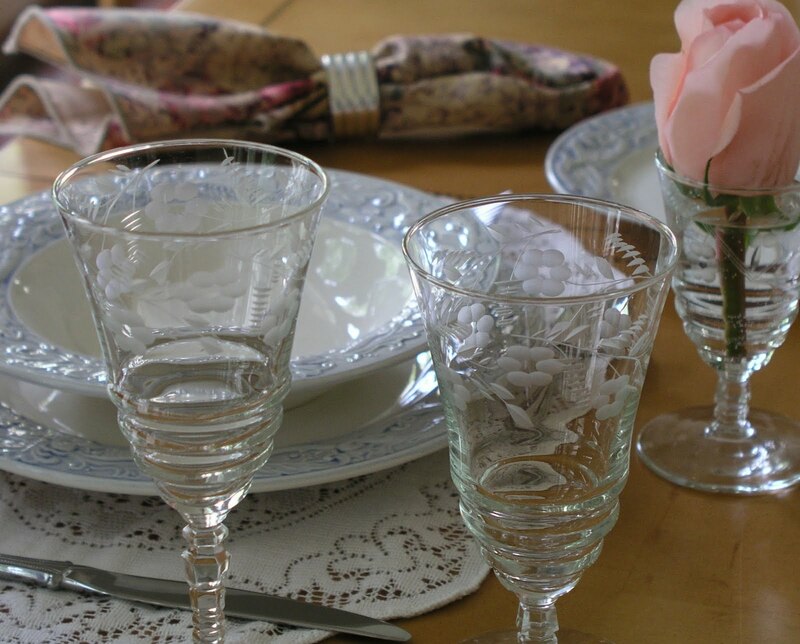 Very pretty dishes and stemware. Roses are always lovely and their soft color looks go so nicely with those pretty dishes! Your menu (especially the dessert) sounded great! You are a classy guy! Bill -- your tables are always stunning and this one even more so becasue it is intended to be used!!!! I was hoping that you were going to share your recipes. Yum! This tablescape is one that I would imagine would be featured in the movie. :-) Thanks for sharing! I love seeing a "real" table! People ask me the same thing, even though mine are more often fun than elegant table settings. I always hate to tell them that most nights with just the 2 of us, we eat in front of the televison! I love the roses. I've always been one that loves all colors of roses except red...too ordinary for me! The salad looks great! I want to see the carnage!!!! I know you can even make that look great in a photo. Nice to see a smaller scale table. Real life...rushing off to see a movie. There is so little out there that I would like to see but that movie is one of them. Oh Bill, You always have a superb table to share! Lovely. I bought me one of those glitzy coaster from a thrift shop just a few days ago. Like how you're using it. Lovely table as always! I love the roses and the elegant decor! And indeed, Jane and Lance are stupendous, are they not? ;) Love their blogging adventures! haha! your table is lovely. The detail photo show how nice the Charter Club's plates are. Your friends are blessed to get a meal on such a pretty table. Hi Bill, lovely table with food!! I would be happy having lunch sitting there all day, I am not a cinema goer, but would just like to relax, chat and drink plenty of cups of tea, you will have to put the kettle and possibly buy a teapot, as I would want hot tea ( The British way!!) not cold. Wouldn't it be great if one day you came across some William Yeoward crystals in a Goodwill shop or Estate sale!!! Next time I am in London I will have a look in his shop along the Kings Road but I know I could never afford the prices. When I glanced at the first picture, I though to myself, "If he says these gorgeous pink roses were purchased at Kroger, I'm going to put a hit out on him!" Sure enough...!!! And just $8 for the dozen? What's up with that??!??!! Kroger is a pretty happenin' store! You would think the flowers in our grocery stores here were found in diamond mines! They charge SO MUCH money for pitiful looking little bouquets that look as though they were put together by lumberjacks! I was glad to see you discuss the merits of cutting flower stems on the diagonal. 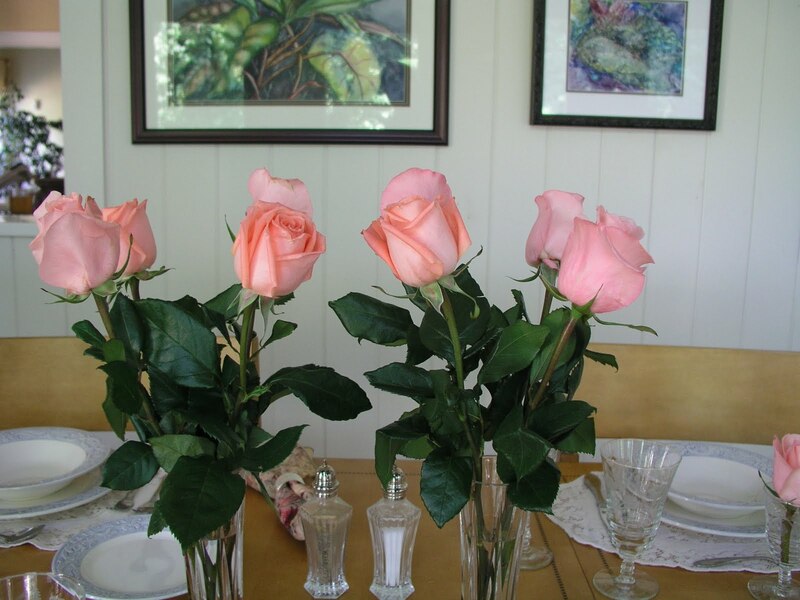 A lot of people don't know how beneficial that is for keeping fresh flowers longer. Right on, Bill! Secondly, the arrangement IS reminiscent of the cover of William Yeoward's book!!! I remember how much I loved that look when I first saw it, and it looks just as great here! Your salad tongs are so cool!!! As always, I am simultaneously seething with jealousy and jumping for joy that you found such great things at the thrift store! You really have an eye for that! The salad looks and sounds delicious as does the entire menu. Glad you opted for the liqueur-drizzled ice cream for dessert rather than chocolate pie! ;-) Beautiful table, Bill!!!!!!! Bill you know how I love your tablescapes,sometimes I'm at a loss for words,and have to pick my jaw off the computer desk,but let me tell you,I LOVE WHEN YOU POST ABOUT FOOD. You have got to be one of the most gracious host. I have not seen "The Help",but heard alot of good things about,hopefully I will see this weekend. Simple, understated, and beautiful...that describes your luncheon table. What a lovely way to host friends. Your meal sounds delightful...Like you, I enjoy "making it up" when I entertain. And after so many years, my friends has come to expect this...even joke about it. You are truly a gracious host. Lovely! The china is so pretty and the glassware too. Lunch sounds wonderful! Please invite me to lunch. The table is just fresh, simple and beautiful suitable for a lunch with friends. Loved the roses, the two vases and the small ones look great. Love the whole table down to the grocery store roses! Especially loved your idea about matching the stemware by shape rather than pattern! Beautful! And where is the Good Will you found those plates? Breathtaking table setting. Bill -- this is so beautiful. I love the shape of those stems and that wonderful salad bowl. What a grand setting. Wish I could have eaten with you for lunch and seen the movie too. Read the book but haven't made it to the movie yet. That salad looks so good! I always enjoy your tablescapes. You find wonderful things and how do you get such deals! The roses are beautiful and so reasonable. Every detail of it looks beautiful! My mom would actually love to see and have all of these. Bill, you never disappoint. Your table is beautiful. We don't have a Kroger anywhere close to us, sure wish we did, your roses are beautiful. I know your guests enjoyed the delicious sounding lunch you served. A lovely setting! Love those roses! This, like all your tables, is beautiful. I always enjoy my visit. Amazing what you can come up with even "on the run"! Love the Country Chateau dishes and your lovely single rose arrangements! Bill this is so beautiful. What a gracious and relaxing setting for friends. Often enjoying ones company is more important that all the finery but we still want our surrounding to be simple elegance. You achieved that with perfection. Hope you enjoyed the movie. I am probably the only one who hasn't seen it yet but I will. Oh, Bill.. I just love this. And I can't get over how you can just execute one wonderful table after another. What I wouldn't give to be able to pop in and enjoy this in person! Did I mention to you that I finally saw "The Help." Mr. M and I went to see it and cried. I seem to be doing a lot of that lately, but that movie was a feel good cry. I think the actresses that played the two lead maids are going to win Academy Awards for best actress and best supporting actress. I hope they win! P.S. You definitely win with this table! Estate Sale at Casa De La Pradera!